Kirkland, WA — Real Time Integration, Inc. announced today the NetAcquire/SIO™ network peripheral. The NetAcquire/SIO accepts serial input/output signals in almost any format, and publishes this data to any Ethernet network. NetAcquire/SIO acts as a network server, and transfers serial data to client computers connected to the network. Client computers can optionally use a standard Web browser to display data with no additional software required. The NetAcquire/SIO offers a unique universal serial interface front-end. 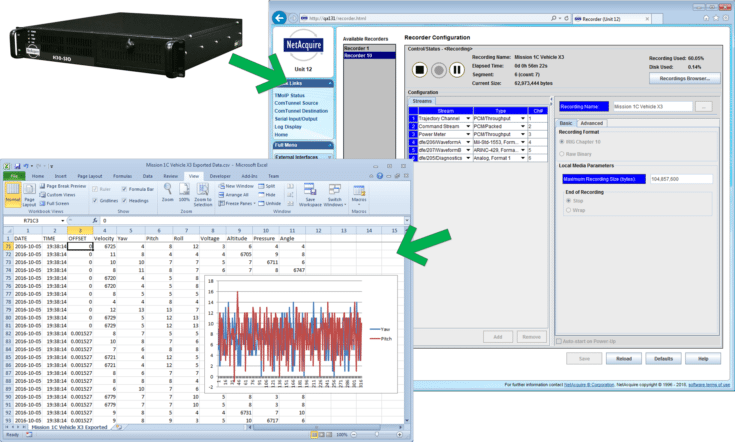 This universal interface allows software selection of all the communications parameters, including bit rate, type of data encoding, synchronization, and network protocol. All parameters can be set remotely from any network client. The maximum input/output speed is 2.5 mega-baud (million bits per second) – more than 100 times faster than standard PC serial communication. NetAcquire/SIO hardware is further optimized as a real-time platform with a dedicated Pentium processor running a true real-time operating system. Data processing on the NetAcquire/SIO supports serial data framing, triggering, analysis, and data reduction. NetAcquire/SIO has particular application in the areas of satellite communication, wide-area networks, high-speed data collection, and digital imaging. These applications generate high-speed streams of serial data in specialized formats. The term “telemetry” refers to measurement information that is transmitted from a remote source to a monitoring station. Because telemetry signals are usually formatted as serial data, they are ideal candidates for acquisition and analysis by NetAcquire/SIO. NetAcquire/SIO includes special extensions to support telemetry applications, including telemetry packet processing and real-time Java displays of telemetry measurements. NetAcquire/SIO is the latest member of the RTI NetAcquire family of intelligent network data acquisition and control products. NetAcquire is the ideal component for building enterprise-wide distributed communication and measurement systems, as well as Internet-compatible nodes that support remote data acquisition and control from anywhere in the world. Real Time Integration, located in Kirkland, WA, provides real-time distributed hardware and software, data acquisition, and communications solutions to companies worldwide.